RohanRhythm Dholak Mumbai Style Nut & Bolt Tuning Gig bag. Two-headed wooden dholak drum that is shaped like a barrel with a tenor and bass head. Drum is held horizontally and played on both sides. Heads are held in place and tuned by straps. In India, these extremely popular percussion instruments are commonly used in folk music and during marriage ceremonies. The shells are manufactured in the Northern Indian State of Uttar Pradesh and made with locally grown neem and sheesham. After transporting to Mumbai, the goat skin heads are fitted to the drum shells. Playing Surface: Tenor: 7" and Bass: 9"
Body: Stained wooden shell with linear etching and 2 colorful bands wrapped around. Heads: Drum heads are made from goatskin. 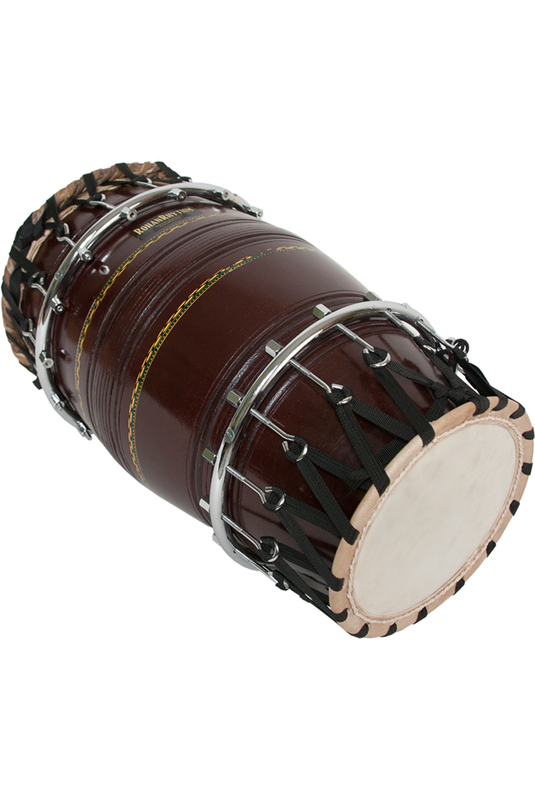 The dholak's higher-pitched tenor head is a simple membrane with a metal ring stitched around the edge, while the bass head, usually played with the left hand, has a load inside that is a mixture of tar, clay and sand (dholak masala) which lowers the pitch and provides a well-defined tone.